Standing desks are fast becoming popular in the office world. If you find you sit down for more than eight hours a day, then you might want to consider what this new way of working can do for you. We are all guilty of working through lunch and not taking the time to stretch or go for a walk, but it’s important we do in order to reduce the risk of health issues later down the line. If you struggle to pull yourself away from your desk for breaks, a standing desk will at least help with encouraging circulation and back posture (but you still need to learn to take a rest). Standing desks are an innovative way of compromising with the hectic lifestyles we lead, and they have a lot of other practical benefits, too. Standing desks are often wall mounted, or adjustable desktop contraptions which make for great space savers if you’ve only got a small study or spare room to work with. What’s more is that you can get both mechanical and electric adjustable desks so you can find the perfect height to work at. If you suffer from back pain, knee pain or any other joint problems, then a standing desk may help ease some pressure on your muscles and may help improve your overall health as standing is said to burn around 50 calories more than sitting. So, take a look at our top picks for the best standing desks that could reinvigorate your working day. This “floating” desk makes for a versatile workstation in your home, so whether you’re doing paperwork or working on a craft project, you can adjust the height of this desk to suit your needs. This is great for those who are considering investing in their first standing desk, and may not want to commit to standing all the time right away. You’ll be able to limit your time sitting, and gradually build up your standing time until you are fully comfortable. Customers found this desk to be incredibly sturdy and easy to adjust, but you’ll definitely need an extra pair of eyes and hands when assembling this one. If you like a lot of space to work with, this this spacious desk should really help you get into the swing of standing while you work. Although this desk looks huge and heavy, you won’t have to worry about adjustment as it’s fully electrical so you can set your desired height with just the push of a button. You have the flexibility to sit on those days when you feel you need it, and there is plenty of space which makes this desk suitable for all types of tasks. The only downside is that it is quite large so not the best for those smaller homes that want to save on space. This extending platform could easily be placed on your existing office desk simply to provide you with the option to adjust to standing height when you feel you need to stretch your legs. The unit itself is fairly small, but you’ll still have your desk space below for any necessary office items. It has 22 varying heights so you can really play around with the height that’s best for you, and you could even place this workstation on other surfaces such as the kitchen table if that’s where you often work from when at home – but the design suggests it is much better suited to a desktop PC rather than a laptop. It’s got a handy cable management system so you’ll still be able to charge all your devices comfortably when standing up. 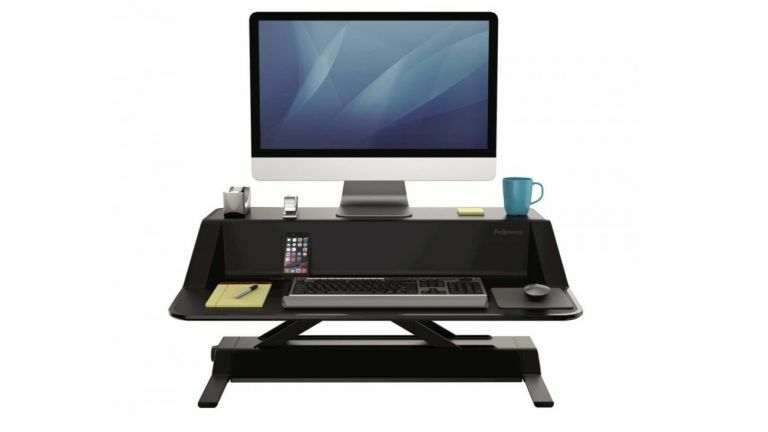 This Yo-Yo Desk is perfect for placing on any work surface and creating a workstation where you can sit or stand. Customers say it’s really easy to set up in your home, but it’s quite large, so you’ll need to do a bit of a clear out first of all if your worktop or desk is quite cluttered. The gas springs make it easy to adjust to your desired height and users found it easy to flip the mechanism without the risk of pinching fingers in the springs. It also comes in different sizes to cater to different sized homes, so even if you only have a small study, this standing desk will fit nicely. This standing desk made from birch plywood is an environmentally friendly alternative to the more common metal designs available. It has a simple design that can be adjusted manually to find the perfect ergonomic position for your PC, laptop, keyboard or iPad. Not everyone likes the wooden design of this standing desk, but if you think the electronic standing desks look a little too complicated for your liking, then this is a simple yet unique design that makes sitting or standing at your desk easy.